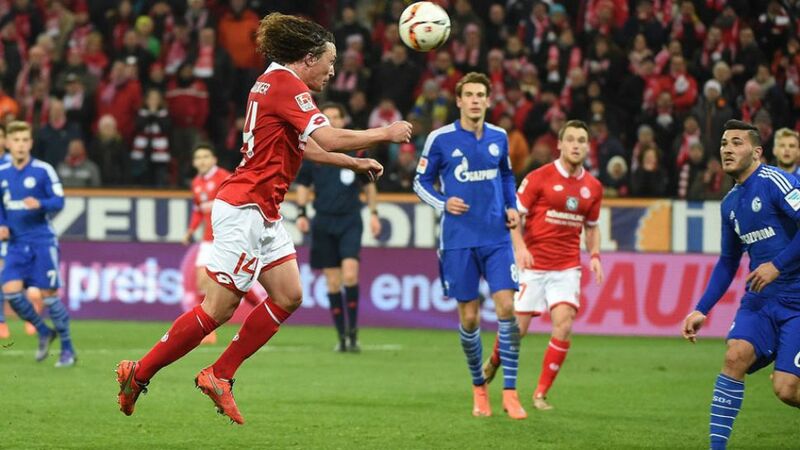 Captain Julian Baumgartlinger scored his first ever Bundesliga goal to earn 1. FSV Mainz 05 a 2-1 win over FC Schalke 04 on Friday night. It was a lively opening at the Coface Arena with neither side holding back. Jhon Cordoba sent the first shot at Ralf Fährmann with Leon Goretzka testing Loris Karius' reactions at the other end. The flow ebbed off a little after the sides had sized each other up, before Mainz drew first blood. Gaetan Bussmann threaded the needle with his low drive from just outside the penalty area as Schalke failed to clear a corner. Schalke were straight onto the front foot in the second half and after Max Meyer's shot was blocked on the line by Stefan Bell, the Schalke midfielder cut the rebound back for Younes Belhanda to drive his shot through a pack of players and open his Royal Blue account. Joel Matip almost headed into his own goal before Baumgartlinger found the back of the net for the first time in nearly five years as a Mainz player, heading in Yunus Malli's cross to clinch victory. Baumgartlinger led by example from start to finish, picking up a yellow card as he made his presence felt in the centre of the field before scoring his first goal in his 112th Bundesliga appearance. As if the action on the field was not entertaining enough, both sets of fans created plenty of noise off it. Following the home fans' habitual rendition of 'You'll Never Walk Alone', Schalke's 5,000 travelling fans ensured their voices were also heard in a typically boisterous Bundesliga atmosphere. Bussmann's goal came from only his third shot in the Bundesliga; Belhanda scored with his second.Mainz captain Baumgartlinger will miss the trip to Hoffenheim after picking up his fifth yellow card of the season.Mainz have not lost in the Bundesliga this season after taking the lead, winning ten and drawing one.